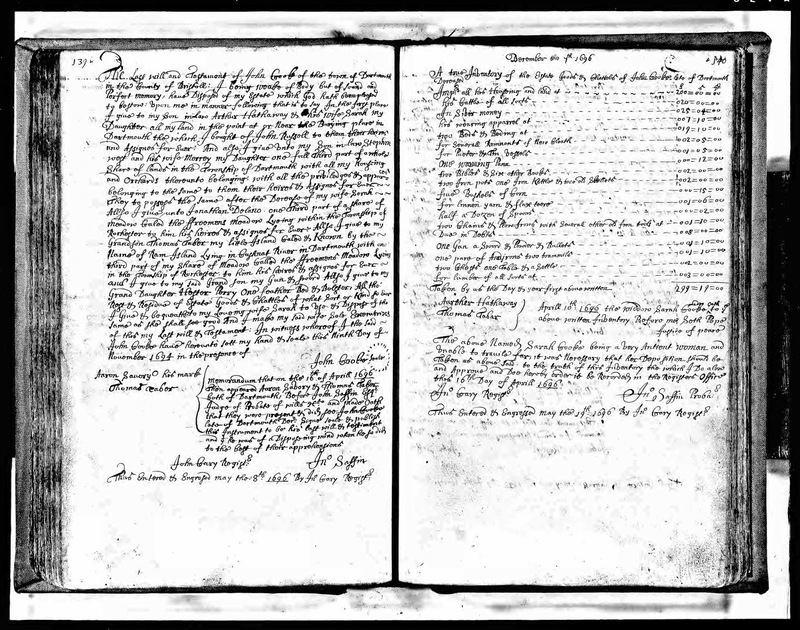 Genea-Musings: Amanuensis Monday - 1694 Probate Records of John Cooke (1607-1695) of Dartmouth, Mass. Amanuensis Monday - 1694 Probate Records of John Cooke (1607-1695) of Dartmouth, Mass. This week's document for Amanuensis Monday is from the Bristol County, Massachusetts probate documents for John Cooke (1607-1695) of Dartmouth, Massachusetts. belonging to the same to them their heires & Assignes for ever. They to possess the same after the Decease of my wife Sarah. in the Township of Rochester to him his heires & assignee for Ever. this 16th Day of Aprill 1696. 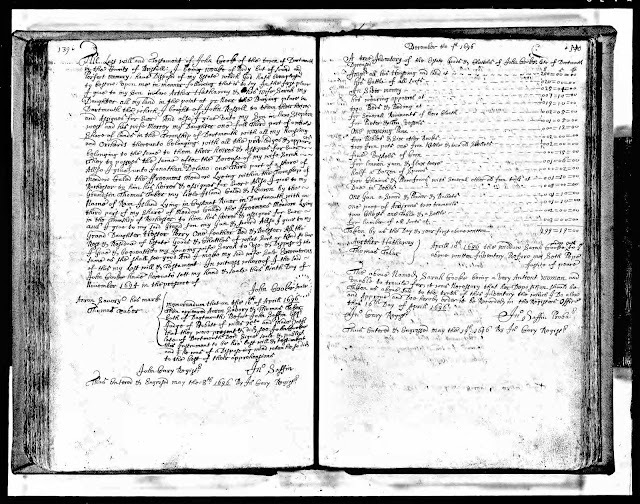 "Massachusetts, Wills and Probate Records, 1635-1991," indexed database with digital images, Ancestry.com (http://www.ancestry.com : accessed 16 April 2017), Bristol County, "Probate Records, Vol. 1-4, 1687-1723, Vol. 3, 1710-1716; Vol. 4, 1721," Volume 1, pages 139-140 (image 78 of 745), John Cooke probate papers. The will mentions wife Sarah; son-in-law Arthur Hathaway and his wife Sarah his daughter; son-in-law Stephen West and his wife Mercy his daughter; Jonathan Delano; grandson Thomas Taber; and granddaughter Hester Perry. There is no mention of daughters Elizabeth (Cooke) Wilcox, or Mary (Cooke) Taber, although the former apparently lived until after John Cooke's death. John and Sarah Warren (1614-1696) Cooke are my 10th great-grandparents. John Cooke was a Mayflower passenger with his father, Francis Cooke, in 1620. My ancestry is through Sarah Cooke (1635-1713) who married Arthur Hathaway (1630-1711) in 1652.